- Libby is annoyed that Karl won't give Darren a break, especially after Darren's efforts with Pete. - Phil's computer hard drive crashes, losing all of Debbie's uni work. - Marlene goes on holiday because she's sick of Cheryl's attitude. Cheryl is fuming that Marlene has gone away and is furiously chopping vegetables. Danni tries to reason with Cheryl, but Cheryl is annoyed and thinks that she deserves a bit of sympathy! Danni tells Cheryl that she's got her support, and she goes to check on Lolly. Cheryl angrily chops a carrot. DARREN: Its name isn't Lou, you know. Darren tells Cheryl to sit down and he takes over making the meal. Mal and Libby are washing up. Mal tells Libby that the house he and Darren were working on looks good enough to be in a magazine. Libby's pleased that something positive has happened for Darren. She leaves to study at Brenda's. Susan tells Mal that she's really proud of him and thinks they should have a celebratory meal tomorrow night. She says Mal can choose the food, as long as it's not takeaway pizza! Karl agrees to the meal, but goes very cold when Susan suggests that as it's a meal to celebrate Mal's business success Darren should be invited as well. MAL: And that's a big no from Mr Prejudiced. KARL: I think we're all aware of how I feel about Darren. MAL: You'd have to be deaf, dumb and blind not to. Mal tells Karl this is his chance to prove that he's got a heart. Karl says he's got nothing to prove - but they can invite who they want to invite. Darren has made Cheryl a herbal drink that's good for relieving stress. He says that he'll help with the heavy stuff down the pub. Cheryl thinks he won't have time with his handyman work, but Darren insists that he'll make time. There's a knock at the door and it's smooooooooth talking Steve George. He's brought around a marketing strategy for selling Number 22. Danni comes back in the living room and is surprised to see Steve. He introduces himself and looks rather taken with Danni. STEVE: Good looks must run in the family. Darren looks half-amused, half put out! Mal has given Libby a lift to school. He asks if she's going to be in for the fireworks display - the meal with Karl and Darren! Libby didn't even know about the arranged dinner, and thinks it will be a nightmare. She asks what Karl's opinion was and is surprised when Mal says that he was ok about it. Libby doesn't think that Karl will be able to keep his mouth shut whilst Darren's at the table. MAL: Like I said, prepare for fireworks! Libby doesn't think it's funny and is amazed that Susan came up with the idea. She reckons that Darren will hate the idea. Shona approaches the pair - she's surprised that Mal's returned to Erinsborough High. Mal tells her he's going to put some quotes in for some handyman work. Shona is pleased at the idea that Mal might be hanging around the school a lot. SHONA: A definite improvement on the scenery. Libby is unimpressed and leaves for the library. Shona tells Mal that she can't wait to leave as the guys at school are really immature. She tells him that things definitely went downhill when he left! Steve has popped in to talk about the marketing strategy for the house. He's managed to wangle a slot in the Erinsborough News' Real Estate section. He wants to push the house as a family home and suggests that Danni could be in some photos. Cheryl tells Steve that Danni might be too busy and explains that she's opened her own clothes shop. Darren catches up with Mal and gives him their payment for the last job, including a bonus. Darren's a bit bummed out that they didn't get paid in cash because it's a pain waiting 5 days for a cheque to clear. DARREN: No more than usual! Mal tells Darren where the main jobs are around the site. Susan comes over and invites Darren to dinner. Darren is stunned and thinks that Karl won't be impressed at him 'rocking up for a meal'. Susan says that Karl knows Darren has been invited. DARREN: And he's cool with it? SUSAN: I don't know if cool is the right word... But he's willing to be tolerant. Susan explains that she wants to try and negotiate a ceasefire between Darren and Karl because she doesn't think the situation can carry on much longer. SUSAN: He and Libby are at one another's throats. They'll probably kill each other soon unless, of course, I kill them both first! Darren agrees and Susan is stoked. She leaves. Mal reckons he can't wait to see Darren and Karl at the same table. Darren tells him that he's doing it for Libby and Susan's sakes - not Karl's. Darren says he doesn't give a stuff what Karl thinks of him. Shona approaches Libby, who is reading a chemistry book. Shona thinks chemistry is boring and comments that she's starving. LIBBY: As hungry as you were this morning? LIBBY: When you tried to eat my brother alive. SHONA: Oh. Right. Well, he's a babe. I couldn't help myself. SHONA: He's your brother, Lib! I'd be a bit worried if you thought he was a babe! So is he seeing anyone? LIBBY: No. No, the rest of the female population obviously feels the same way I do! Shona says that guys like Mal don't stay available for long. Libby says that it doesn't sound like he will stay available if Shona's get anything to do with it! Debbie is typing her uni work on a typewriter. Phil is walking around telling Debbie the plot of his new story - it's about a guy who's in a wheelchair, who falls in love with a nurse who then helps him to walk again. Debbie wants him to shut up so she can get on with her uni work. PHIL: Just tell me if she should be the nurse or not. DEBBIE: Why not a doctor? PHIL: No! She can't have a better job than the hero. PHIL: Because feminism doesn't sell, Deb! Luckily for Phil, there's a knock at the door and he runs off to get it as Debbie tries to hit him. It's Cheryl, who thanks Phil for helping to search for Lolly earlier. She asks if Phil will work at Chez Chez to help her out. He tells her that he's taken another advance for a romance novel and he's got a deadline looming - which has been worsened by the broken down computer - so he hasn't got much free time. He offers to do the odd shift here and there, but Cheryl needs someone more permanent. Phil suggests Debbie step in, but Debbie thinks she has too much uni work. Cheryl says that she'll let herself out. Phil turns to Debbie and wonders why she didn't jump at the chance of the money. She says she would - if it was anywhere but Chez Chez! DEBBIE: I don't want to run the risk of getting another fine. And I'd be bumping into Darren Stark every five seconds. No amount of money could make up for that. Susan and Karl are putting some shopping away. Libby comes in from school. LIBBY: Oh look, if this is for tonight, you might as well stop right now. SUSAN: Why? Are you advocating we all go on a hunger strike for something? LIBBY: No, I'm trying to stop World War III from happening! Susan tells Libby that she's already invited Darren, and he's already accepted the invitation. Karl tells Libby that it's just one meal - they can cope with that. Libby thinks that going by past history, she's not sure they can! Libby and Karl argue some more, and Karl says it's fine by him if she calls the whole thing off and stalks off. Susan tells Libby that she's not going to put up with her petulant attitude for much longer. Libby is outraged. Susan points out that Karl has agreed to go along with the dinner, despite his feelings towards Darren - she's being the difficult party. Susan tells Libby that this is their chance to show Karl that Darren's a decent guy. Libby says she knows what will happen - Darren will come over and Karl will go off at him. Susan thinks that if Darren doesn't come over, the atmosphere will still be sour between them all anyway, so where's the harm in trying? Danni answers the door to Steve George. He invites himself so he can look around - apparently it helps him when he's selling a house if he can get a feel of the other properties around it! Danni doesn't look convinced. Steve thinks that surroundings are very important and is blatantly hitting on Danni. STEVE: It seems to be a very desirable neighbourhood. DANNI: Do you learn lines like that at real estate school? STEVE: It's not a line, Danni. I like what I see around here. Danni tries to get him to leave and Steve says it's time for him to 'fess up - he's not been exactly truthful. DANNI: What? A real estate agent who doesn't tell the truth? Surely not! Steve tells her that ever since he saw her last night, he can't stop thinking about her and invites her out for dinner. Danni avoids the answer, saying she has to get back to work. Steve offers to give her a lift in his convertible. DANNI: Oh please, you're such a cliché! Steve reckons he's a very nice cliché - and Danni should definitely have dinner with him! Libby is saying that the meal could go either way with Karl tonight. LIBBY: Why can't I have a normal father? DARREN: Just lucky, I guess. Darren says that the worst case scenario can only be that he finds out that Karl hates him more than he thought - but on the positive side, he's getting a free meal! Danni is repeating that she has a boyfriend to Steve but he's taking little notice. STEVE: How can you have a boyfriend who's not me? DANNI: Quite easily, I've only just met you. STEVE: Good! So dump your old boyfriend and come to dinner with me. DANNI: It doesn't work like that. STEVE: It can if you want it to. STEVE: That word's not in my vocabulary, Danni! STEVE: Please. Pretty please. With sugar on top. Luke walks in just in time! Danni introduces Luke to Steve, and Steve tells Luke that he's a very lucky man. Luke pulls Danni to one side to give her an excuse to get away from Steve. Steve gets a phone call and makes his excuses. Luke asks Danni what Steve wanted, but Danni says he was just saying hi. Luke looks a bit bemused. Darren compliments Susan on her cooking. Mal makes a joke about Susan burning the house down and Susan is completely over the top in her laughter. Karl glares at everyone whilst he carves the meat! An uncomfortable silence falls over the table. Susan jokes that if she did burn the house down, Mal and Darren could help her out. Karl coldly suggests that there's better ways for them to drum up business. Mal says that Karl's right - he and Darren have got heaps of work. Another uncomfortable silence falls. Susan comments that the job at the school could be a good little earner. Mal says that he bets Karl didn't think he'd see him back at Erinsborough High. Karl stiffly remarks that he hasn't got the job yet. Mal rolls his eyes. Another uncomfortable silence! Darren breaks it and asks after Pete. Karl shortly says that he's being looked after. Darren says that he seemed like a nice kid - he just needed someone to give him a go. Karl ignores the bait and asks who wants lamb. Susan gives him a death stare! Steve knocks at the door and Luke answers. Steve pretends to have forgotten Luke's name (told you he was smooth!) and asks after Danni. Luke tells him she's out - and won't elaborate on where. Steve wants to stay and wait for Danni to return, but Luke tells him it's too late for visitors. Steve says he's ok waiting up if Luke wants to go to bed! Luke says that Steve can leave a message with him, but Steve reckons it's about Danni's shop and he'd rather not go through a third party. Luke refuses to budge, so Steve leaves and tells Luke to mention that he popped around. Luke looks pretty annoyed. Everyone is eating in an (you guessed it) uncomfortable silence. Mal and Darren compliment Susan on the food. Susan asks about dessert, but Darren, Mal and Libby all tactfully say that they're full. Susan looks pained, and suggests that Darren stay for a coffee. KARL: Susan, if he wants to go, then he wants to go. Karl gets up and purposely picks up Darren's plate - which he was still eating from! 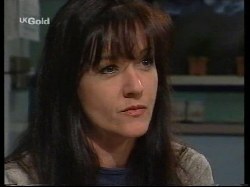 Susan apologises to Darren. Darren quietly says that it's cool and walks out with Libby. Mal turns to Susan and jokes about how well it went. Susan looks exasperated. Libby shuts the door behind her. LIBBY: My dad needs a big kick up the backside. DARREN: Yeah. Well, maybe someone will give him one. He kisses Lib on the cheek and leaves. Cheryl is sitting with Debbie, who has changed her mind about wanting the job. Debbie confesses that she was concerned about being fined again, but Cheryl says that if she checks everyone's ID she'll be fine. Cheryl tells her that it's just bar work as Darren will be taking care of everything in the cellar. They agree to work out a rosta when Debbie checks her uni timetable. Debbie leaves Chez Chez and there's a huge explosion from the surgery. 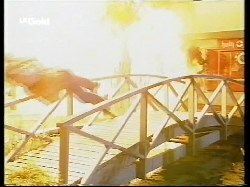 Debbie is thrown to the ground with the force of the explosion. Darren was standing on the bridge, and he is thrown off the bridge. 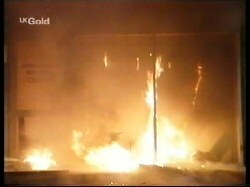 A huge fireball rages up into the sky and alarms start to sound. Debbie looks up and sees Darren, who looks back at her.